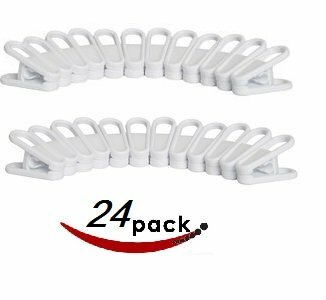 Get more from your clothes hangers with this twenty four of white hanger clips. set of 24 plastic clips are a simple solution to clipping fabric to hang-dry laundry, or putting a temporary closure on an open bag of chips, offering more durability and strength than a typical wooden clothespin. The white color accents any laundry room. If you have any questions about this product by 1InTheHome, contact us by completing and submitting the form below. If you are looking for a specif part number, please include it with your message.